So I loaded about 50 -200 gr swc as well as about 50- 185 gr Zero LSWCHP and pretty sure I screwed up. I am using Dillon dies and just seated so I got a OAL that showed about 1/16" of the shoulder. After reading this I'm wondering if I loaded those 100 rounds correctly? I could pull them if needed but I dropped each one in the barrel and they all plunked in just fine. Honestly, I loaded these with titegroup and after more reading not sure I even want to use titegroup with lead...I found 5 lbs of bullseye so I will be using that with the lead...Sorry, I digress. I'm trying to find the seater plugs for the dillon on Ebay but not having any luck/....Steve Bathe I think...Cant find a thing. as long as they chamber ok, and are at or a little below the barrel hood, you should be fine. Try them in your magazines. They may be too long to fit down into the mag tubes. If they are you can try to seat them slightly deeper IF they are not crimped too tight. If it raises a ridge of lead at the front of the case you will have to pull the bullets and redo the bell to rework them. kwixdraw wrote: Try them in your magazines. They may be too long to fit down into the mag tubes. If they are you can try to seat them slightly deeper IF they are not crimped too tight. If it raises a ridge of lead at the front of the case you will have to pull the bullets and redo the bell to rework them. I load all of my .45 with about 1/16" sticking out. They seem to feed better for me so that's what I go with. 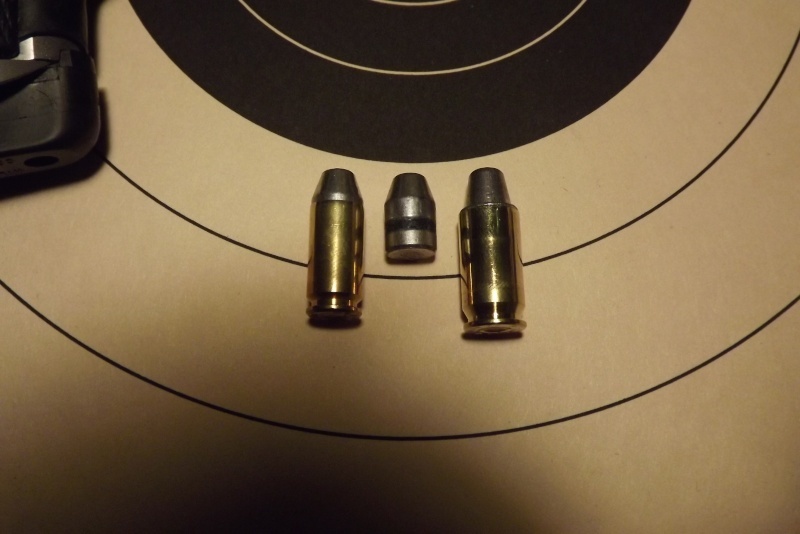 Bullet on the right is a .45. Had this pic on file. I have used Titegroup with lead for two years now. No issues, no leading, but I use real light loads. So far it sounds like you are doing just fine. You don't need a Steve Bathje seating die to make good ammo. What powder charge did you use? While it's always good to read and double check yourself when reloading, I think these loads will be fine. Good .45 ammo isn't rocket science. Everyone has a favorite load, sometimes even based on facts. With a good bullet nearly any powder will shoot well. You need to find which load your gun likes. Really the only time it matters is at 50 yards. Almost any load will shoot Xs at 25. The 1/16" is fine. I use misc. Cases and with the different case lengths the lead showing can be all over the place. it's just not that critical as long as they will function in your gun. I've never heard if any issues with Titegroup and lead. I've got about 1600 sitting, waiting their turn to be shot now. 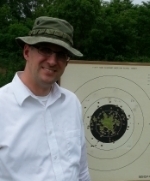 I've used Bullseye, Clays, RedDot, Claydot, Titegroup, 700x, WST, probably a couple others I'm not remembering and they will all shoot lead and group tight. What's between my ears usually is the limiting factor. A 200 hg68 style lswc, good set up that always works, 3.9 bullseye, seat to .032 above case rim or OAL of 1.250 crimp to .469, on the 185 lswc-hp 4.0 bullseye, seat the same, oal of 1.215 and same crimp. these loads will drill the 10 ring @ 50 yards with any good accurate 45. DavidR wrote: A 200 hg68 style lswc, good set up that always works, 3.9 bullseye, seat to .032 above case rim or OAL of 1.250 crimp to .469, on the 185 lswc-hp 4.0 bullseye, seat the same, oal of 1.215 and same crimp. these loads will drill the 10 ring @ 50 yards with any good accurate 45.